Lakeshore Records has released the Gambit – Original Soundtrack digitally and as a disc-on-demand on May 13, 2014. The album features original music by Rolfe Kent (Labor Day, Sideways). 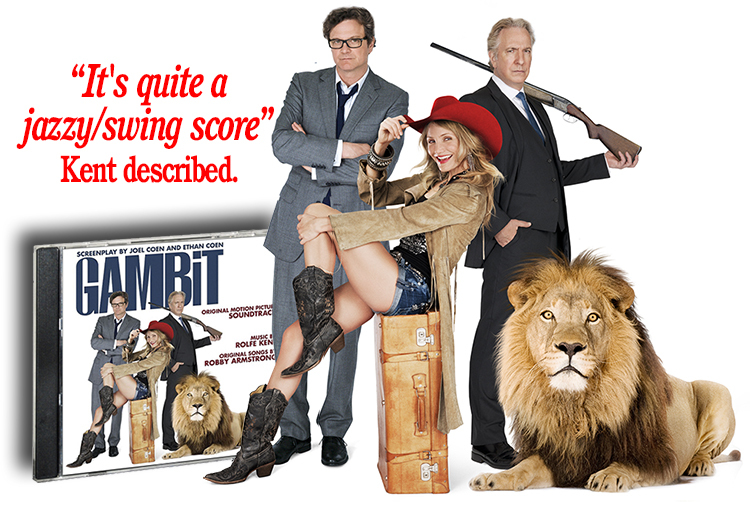 In GAMBIT an art curator (Colin Firth) decides to seek revenge on his abusive boss (Alan Rickman) by conning him into buying a fake Monet, but his plan requires the help of an eccentric and unpredictable Texas rodeo queen (Cameron Diaz). The unexpected textures and sounds of instruments are the hallmarks of musician Rolfe Kent, composer of more than 40 films, including the 2014 releases of Labor Day, The Vampire Academy, and Bad Words, along with Sideways (Golden Globe and Critics’ Choice nominated score), About Schmidt, Election, Mean Girls, Nurse Betty, Legally Blonde, Wedding Crashers, Just Like Heaven, The Matador, Thank You For Smoking, Reign Over Me, The Hunting Party, 17 Again, Ghosts of Girlfriends Past, The Men Who Stare At Goats, and Up In The Air. Kent received an Emmy Award nomination for Outstanding Main Title Theme for the hit Showtime series Dexter. “Michael [Hoffman, director] was great at guiding the precise tone of any moment, and so there was lots of back and forth as we got the feel just right,” said Kent.